I attended the 3rd annual Meet & Mingle at SHOT Show 2018, held on Thursday, Jan. 25, from 4 to 6 p.m. in the Bonnier Sportman’s Lounge at the Sands Expo. But why take time out of SHOT Show to stop and hang out with the gals? 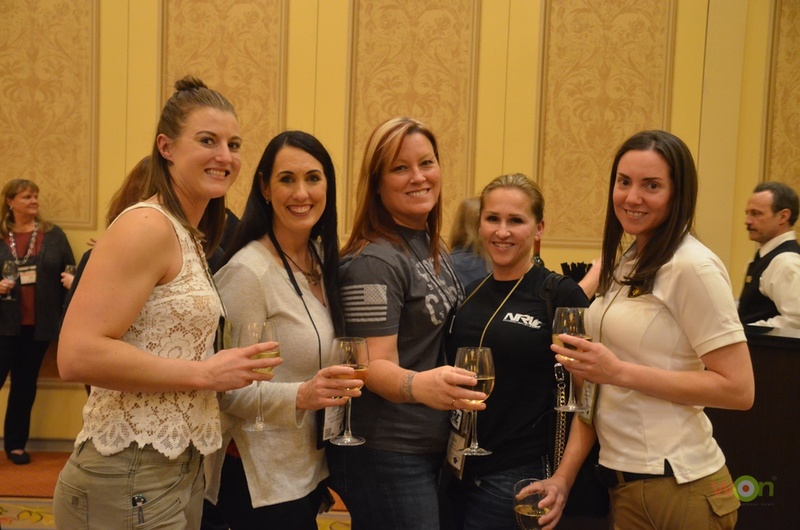 Well, if you’ve never been to SHOT Show, you might want to read a little of what you will find in this group of women during this brief interlude. A peek from behind the podium as Tisma Juett welcomes the women during the 3rd Annual Women’s Outdoor News Meet & Mingle. Professional competition shooter Julie Golob is videoing Tisma’s remarks. For those who have never been to the NSSF Shooting, Hunting & Outdoor Trade, aka SHOT, Show, you might not understand just how massive the show is – 3 floors, scores of ballrooms, hallways, exhibit halls and corridors lined with booths. Radio shows, TV recordings and an entire DAY at the range devoted to what’s new in the firearms industry each year fill an agenda to overflowing. There is so much, that you phyically cannot take it all in. Some of the show-goers have tabulated and reported on their mileage (I’ve heard anywhere from from 5 to 43 miles!). You can bet on sore feet, stiff necks and headaches … and what really hit me this year came in the form of sensory overload – sights , sounds, smells (yes, this is an indoor space), a physical hum to the space from so many people moving about, and by the end of the day, my head screaming for 20 minutes of peace and quiet before the night events began, with parties, dinners and more work. And to be honest, the women at this event came to WORK. 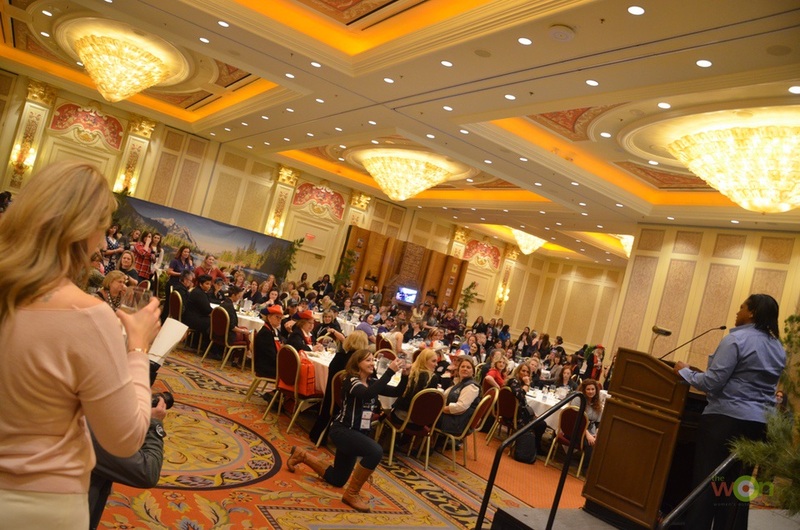 Olympians, national champions, shooters, writers, bloggers, small business owners, big business executives, designers, 2A advocates and more make up the women’s taskforce of the SHOT Show industry representation. 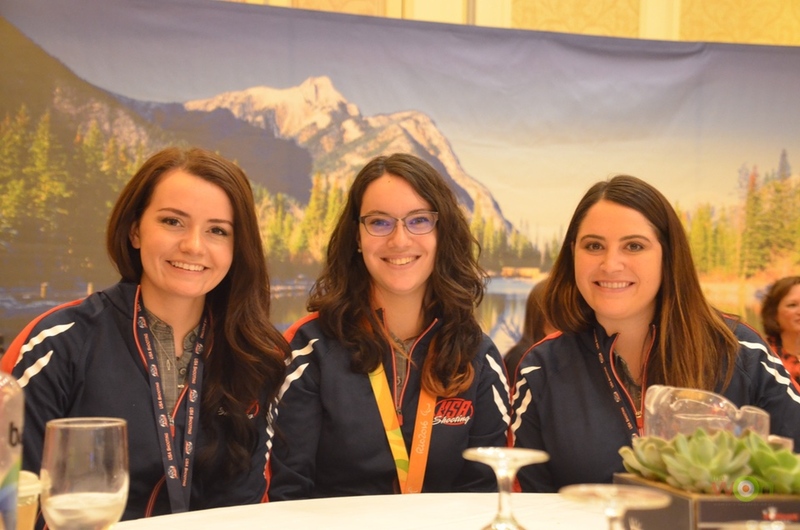 Members of Team USA Shooting – Rachel Martin, McKenna Dah and Caitlyn Connor. Ladies staffing the Bonnier Sportsmen’s Lounge to help the event run smoothly included Eshonda Caraway and Vanessa Vazquez. This is my 3rd year attending, and one of the things that strikes me about this event is that for many, in such an insane week of work, the Meet & Mingle provides a chance for them to connect with people that we need to meet and have business with, but also friends we otherwise might not get a chance to catch up with, due to people’s busy schedules. 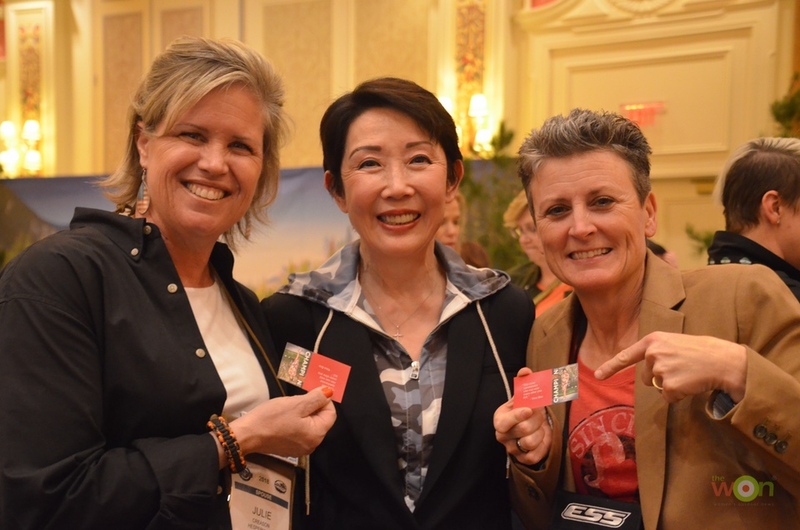 These women felt honored to meet Vera Koo, who has earned 8 Bianchi Cup titles and 2 World Championship titles in NRA Action Pistol. She’s a mother, an author and an all-around amazing woman. Tisma Juett, again, with Becky Bowen. The sponsor list for this year’s Meet & Mingle included Babes with Bullets, Beretta, Crossbreed Holsters, DIVA WOW, Jagemann Sporting Group, NRA Women’s Network, National Shooting Sports Foundation, Remington Outdoor Company, Sentry Products Group, Smith & Wesson, The Well Armed Woman and BulletProof Communications. 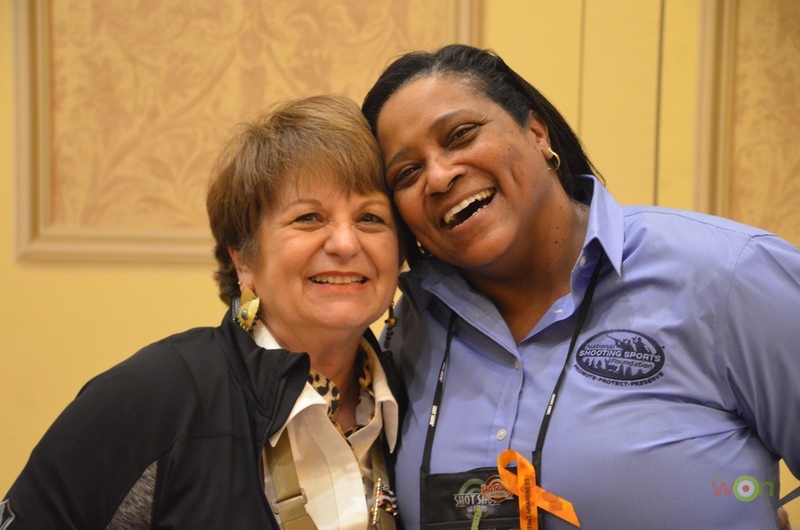 While some corporate sponsors took a few minutes to share their missions and say hello to hundreds of influential women in the firearms industry at the event, others met new faces and people they’d only corresponded with before now. 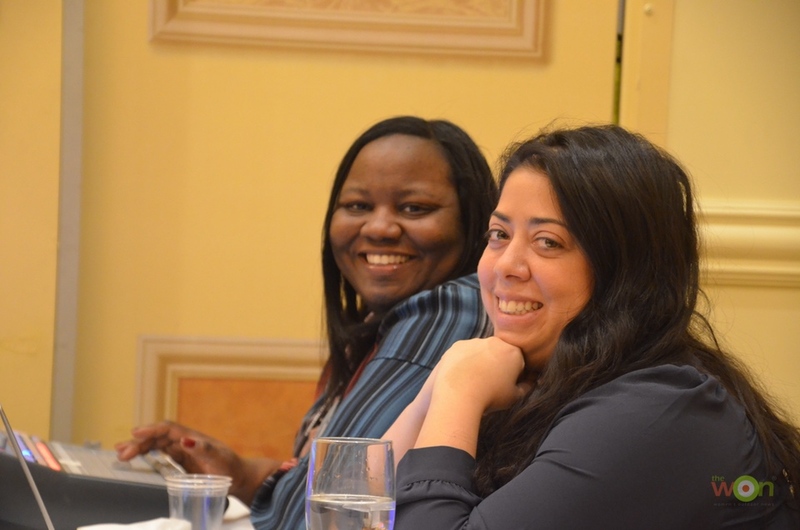 Amazing appetizers paired with an adult refreshment offered women an opportunity to relax after 3 days on the show floor and share a little of what it means to be a female in an historically male-centric industry. 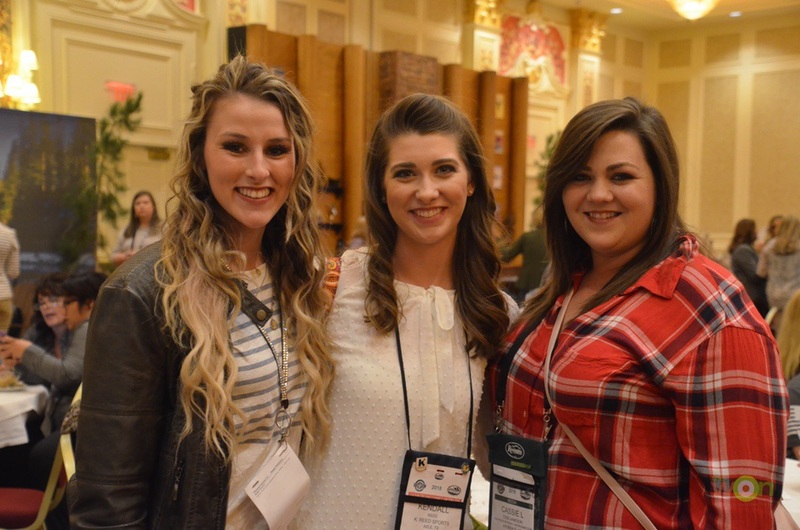 Raegan Robertson, hunter, and Kendall Reed, from Team Krieghoff, stop to chat with Cassie Todd-Jameson of Gun Freedom Radio. L-R: Jesika Johnson, Jennifer Seymour with The Shooter’s Mindset, Regina Milkovich, Janae Frehner and Sara Harenchar. From concealed carry, to running ranges, to match direction to media, there are women like these all over the firearms community. Read that as this translation: Women often decide on sponsorships, media coverage, and direction on where matches happen and money is spent. This experience – of women wanting to socialize and network within an industry – isn’t isn’t unique to Americans … we met 2 ladies from across the pond, Victoria Knowles-Lacks and Claire Sadler. Victoria is the founder of The Shotgun & Chelsea Bun Club. The Brits led the room in a rousing song, “For She’s a Jolly Good Fellow,” to thank the hostess and organizer, Barbara Baird. They also shared some insight into the same sort of relationships women experience around the world, highlighting that while we all come from different corners of the world and country, we all share some pretty common goals – one of which is to simply share our own excitement and enthusiasm with other women in general. When Barbara took the podium, she thanked Bonnier’s Eshonda Caraway, for creating the event again this year. She also thanked co-planners pro-competition shooter Julie Golob and Tisma Juett, Manager of Inclusion & Outreach, National Shooting Sports Foundation. Claire Sadler and Victoria Knowles-Lacks from The Shotgun & Chelsea Bun Club took the stage for a few minutes. Note The WON’s Michelle Cerino video-recording their toast/song. They are friends from 2 continents, connected through firearms and common interests and introduced via the Internet a few years ago, when Barbara Baird noticed their organization online. Barbara has been shooting and hunting with them twice in the past 2 years in the UK, and they have been in the States, shooting and hunting with Barbara, as well. What I really love about this event though is not that it’s for women, but that it’s for ALL women who attend the show. No special invite required. No “cool kids” list you have to be on. No late night party over drinks off campus. Just bring your smile and your ambition and come meet other women who are out working in the industry just like you are. 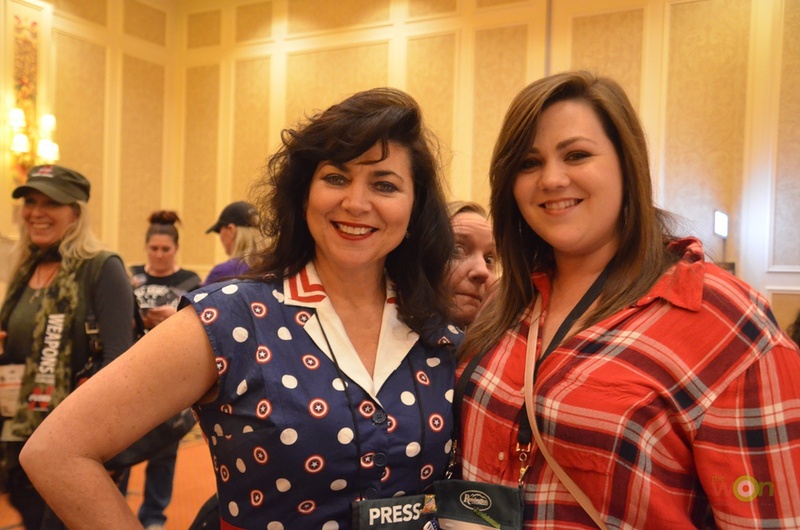 Mother and daughter team, Cheryl Todd of Gun Freedom Radio and her daughter, Cassie Tood- Jameson, pause to frame one of the ladies who enjoyed her glass of wine and a break from the hustle … Rebecca King, we see you! 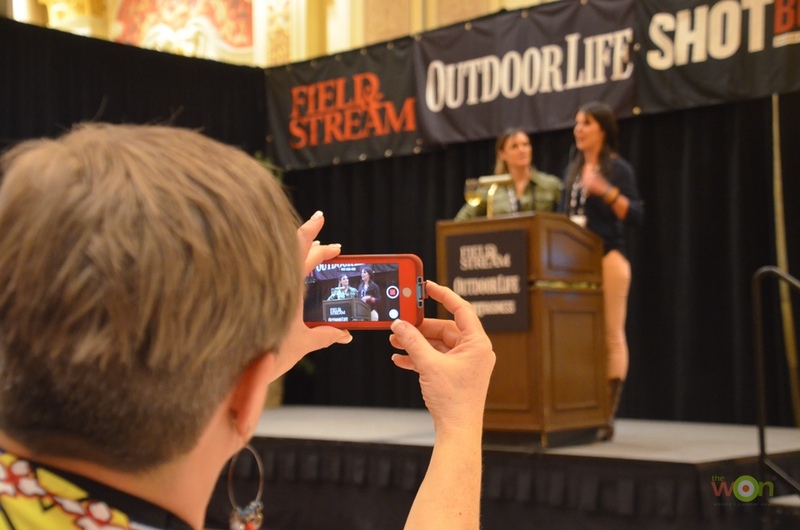 For more information about sponsoring the 2019 Meet & Mingle, contact Barbara Baird here at Women’s Outdoor News.